Basement of Ghoulish Decadence: Swap Meet Finds: Today was Mainstream Bootleg and Karate Kid Day! Swap Meet Finds: Today was Mainstream Bootleg and Karate Kid Day! Oh how my life is thrill-packed! Heh. Anywho, anyone who is a seasoned swap meet picker is probably quite aware of the following phenomenon. This doesn't happen every time, but there's certain days where you see the same particular yet random things again-and-again. Maybe a movie, book, or something strange like the same portable Technics radio or Dora the Explorer umbrella. Well, today I kept seeing sellers across different swap meets with a variety of bootleg tapes of '90s flicks and the old RCA/Columbia Pictures Home Video tape of The Karate Kid, Part II. Must have seen that one five times today. The day started off with a bang...sorta. The first tape I found within minutes of the first place was Video Gems's big box of I Dismember Mama (gotta love this trailer). The only problem is that the actual tape is missing with the inner clamshell case having a big Continental Video sticker indicating Class Reunion Massacre. 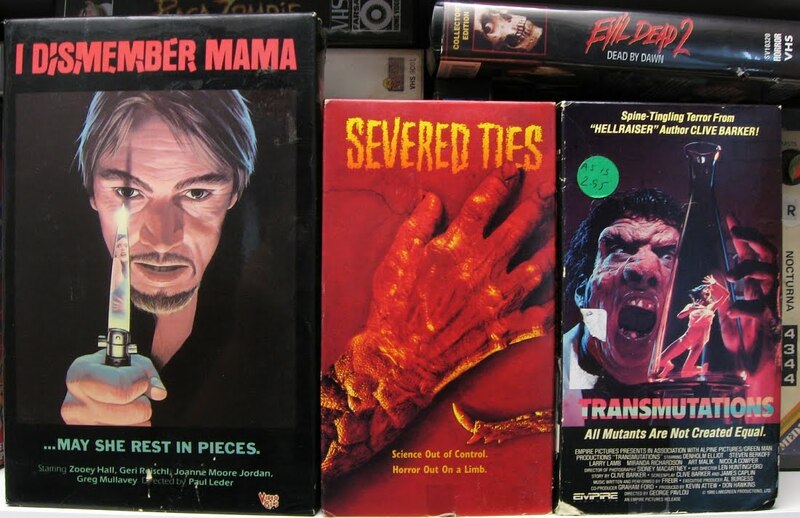 Blah, it was only a buck and I already have both tapes with I Dismember Mama being cut-up. The same guy had the common Anchor Bay Evil Dead 2 clamshell and a beat up Transmutations. Still want to check out the latter since my copy was unplayable with ribbons of mold invading the tape. Finally, the 1992 Columbia/Fangoria Films embarrassment, Severed Ties. 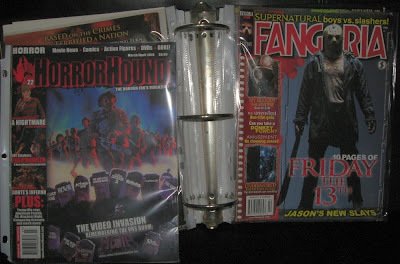 Though in what's the coolest buy of this weekend, I got a binder containing Fangoria #268, 270, 275, 277, 279, 280, 288, 290, 291, Horrorhound #20-22, Rue Morgue #95, and Heavy Metal Fall 2007 30th Anniversary Special for $14!?! Wow. That kid with the binder must be PISSED OFF at his mum! I guess the Cult of Zabka was expected to arrive at the swap meet that day.